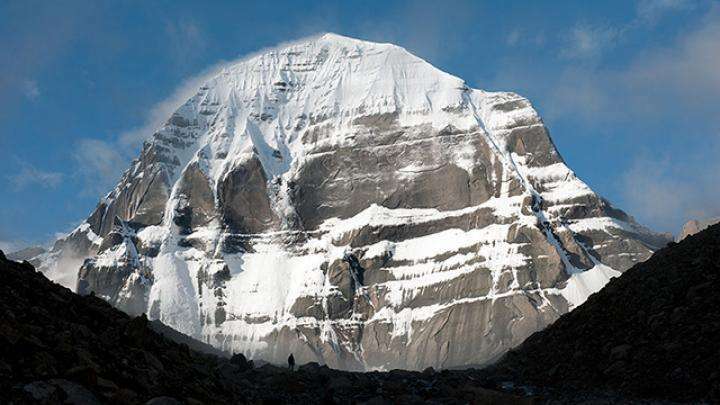 An imposing 21,778-feet tall, the magnificent and majestic Mount Kailash is more than just a mountain. It’s a legend. A revelation. An epiphany. A journey, that is both outwards and inwards. Located in the Himalayan mountain ranges of the remote southwestern corner of Tibet, Kailash is not just one of the highest parts of the world and the source of four mighty rivers of Asia — the Brahmaputra, the Sutlej, Ganga and the Indus — but it’s also one of the most significant spiritual spots on the planet, revered by millions of people from different religions. 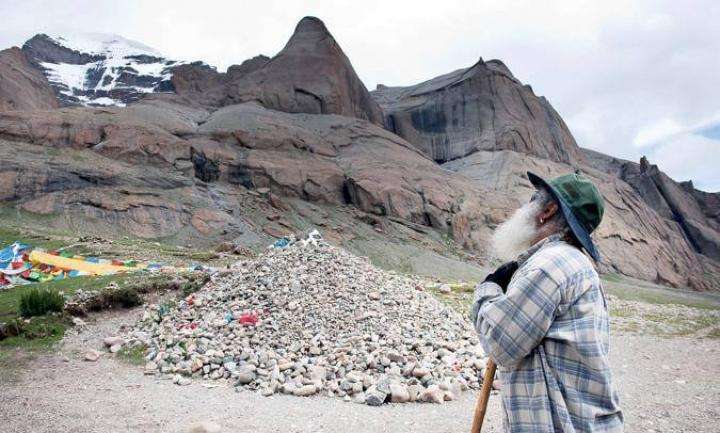 But more than anything, the journey to Kailash Manasarovar is a life-changing experience for the thousands of pilgrims who undertake it every year, catapulting them into uncharted inner frontiers like nothing else can. For a pilgrimage to this isolated, timeless, breathtaking and fascinating spiritual spot is like a journey within yourself. 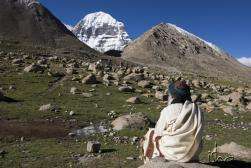 Kailash Sacred Walks, a program by Isha Sacred Walks, offers you the once-in-a-lifetime opportunity of embarking on this journey to Kailash Manasarovar. All our fellow travelers will unanimously agree that they returned from this trip completely transformed. The magical and mystical spot has been drawing people to its divine presence for various reasons. Here’s why you should not miss the chance to be a part of the Kailash Manasarovar yatra. Hindus believe Mt. Kailash to be the abode of Lord Shiva, the holy center of the earth and the manifestation of heaven itself. Tibetan Buddhists profess that Kailash is the home of the Buddha Demchok who symbolizes supreme harmony. In Jainism, Kailash, referred to as Mount Ashtapada, is the place where the creator of their faith, Rishabhadeva, attained freedom from the cycle of life and rebirth. Just 20 kilometers away from Mt. Kailash, the sacred blue and emerald green Manasarovar lake that lies at a height of 15,015 ft, is said to be an epitome of purity, containing healing properties and the power to wash off all mortal sins. 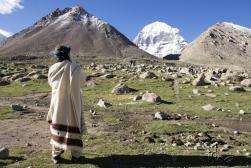 For these reasons and more, a trip to Kailash Manasarovar is an intense spiritual experience, complete with the inclusion of meditation sessions, satsangs (spiritual discourses) and much more. The 13/14-day trip will commence at Kathmandu, where you will explore the ancient city. Then it journeys into Tibet, with a drive to Saga, and overnight camping and meditation sessions at the breathtaking Manasarovar Lake. 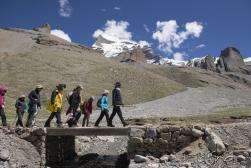 This will be followed by the challenging yet fulfilling trek to the North face of Kailash, where you will get a chance to meditate in the presence of the mighty peak before you journey back. A sojourn to this "roof of the world" is an arduous but rewarding one. Every single traveler of this incredible journey undergoes a humbling and enlightening transformation, which cannot be described, but can only be felt first hand. Get ready for some incredible experiences. Soak in the sights of cliff-top monasteries, yak caravans leisurely ambling over snowy passes, and the magnificent peaks of the Himalayas. But most importantly, get ready to have an honest peek into your own self. As Sadhguru says, you return home with “a little bit of Kailash with you in your heart and your mind”. With our team of highly skilled, trained and dedicated volunteers ever ready to help you with every step you take on this memorable journey, you will be enveloped in a sense of endless energy, tranquility and oneness. This year, our groups will embark on the Kailash Manasarovar Sacred Walk between July 22nd and September 15th. Come, be a part of this beautiful and enlightening journey with us. * For participants with Non-Indian passports. 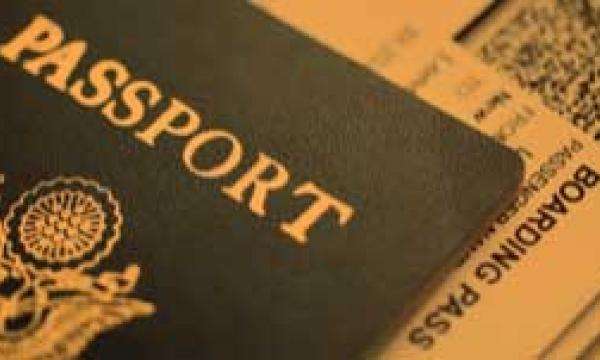 ** For NRI – Indian passport holders only. The given dates are to and from Kathmandu, Nepal. Participants of Group A, S, AL and C will have the privilege of a Sadhguru Darshan. Passport – color copy of the passport pages that show your photo, validity details and address. Please ensure the copy of your passport pages are clear. Scanned color copies of Passport & Passport-size photo can be emailed to us. A registration confirmation will be sent within two weeks of receiving your application, documents and medical reports. Devote the day to a guided sightseeing tour of this 2000-year-old city.Two of the finest gems on your itinerary – Patan and Boudhnath stupa – the largest Buddhist stupa in the world. Satsang and orientation complete the day. The word “Lhasa” translates into the “Abode of God” and was once named the “Forbidden City”, as only those initiated into a spiritual process were permitted to enter the city. Today, Lhasa is a dynamic and bustling city that still holds an old world charm. As you fly to the capital city of Tibet, enjoy the stunning view of Mt. Everest, the highest peak in the world. A stay in the sprawling city of Lhasa is just the thing to help with high altitude acclimatization. Immerse yourself in Tibetan culture by visiting some of the famous temples and monasteries. Prepare yourself for incredible vistas of sand dunes, snow-capped mountains and large lakes as you fly and later drive to Manasarovar. Your first view of this freshwater lake will be truly breathtaking. Being the highest source of freshwater in the world, this blue and emerald green lake seems otherworldly. Stay overnight on the banks of the lake and drink in the peace that surrounds this space. This will be a mystical day of meditation and invocation. Experience a refreshing shower from the water of this lake, which is known to be an epitome of purity, containing healing properties and said to have the power to wash off all mortal sins. One more overnight stay at the lake allows you to absorb your experiences. Get ready for a trail that is as challenging as it is rewarding. Pack up and drive to the starting point of the trek, Yamadwar, and begin the trek to Dirapuk. En route, behold the sights of cliff-top monasteries, yak caravans leisurely ambling over snowy passes, and the western face of Kailash. Finally, experience the powerful and indescribable phenomenon of this revered mountain. As you stay the night at its base, indulge in the beauty and immensity of the esoteric Kailash. Today, we trek from Dirapuk to the north face of Kailash for meditation in its mighty presence. It’s time to allow the essence of Kailash to take root in you. Staying another night at Dirapuk, in the company of this enchanted peak will allow you to fully imbibe and take in your experience. The trek comes to a close as you head back to the quaint little town Darchan for an overnight stay. This is the final leg of the journey in Tibet as you drive to Ali and fly back to Lhasa. We close the sojourn with a Satsang and Guru Pooja, an offering of gratitude to the great Masters of the past and present. Fly to the capital city of Tibet, Lhasa. The word “Lhasa” translates into “abode of god” and was once named the “forbidden city,” as it permitted only those initiated into a spiritual process to enter. Today Lhasa is a dynamic and bustling city that still holds an old world charm. A stay at the sprawling city of Lhasa is just the thing to help with high altitude acclimatization. Immerse yourself in Tibetan culture by visiting some of the famous temples and monasteries. Let the magnificent scenic Himalayan landscapes soothe your senses as you journey to Shigatse, the second largest city in Tibet. Drive down to Saga (“happy land”), which is situated along the banks of the Brahmaputra. Feast your eyes on the enchanting beauty of Tibet and shop for last minute supplies. Prepare yourself for incredible vistas of sand dunes, snow capped mountains and large lakes as you travel to Manasarovar. Your first view of this freshwater lake will be truly breathtaking. Being the highest source of freshwater in the world, this blue and emerald green lake seems otherworldly. This will be a mystical day of meditation and invocation. Experience a refreshing and cleansing dip in the lake, which is known to be an epitome of purity and to possess healing properties. Stay overnight on the banks of the lake and drink in the peace that surrounds this space. Get ready for a trail that is as challenging as it is rewarding. Pack up and drive to the starting point of the trek, Yamadwar, and then trek to Dirapuk. Enroute, behold the sights of cliff-top monasteries, yak caravans leisurely ambling over snowy passes, and the western face of Kailash. Finally experience the powerful and indescribable phenomenon of this revered mountain. As you stay the night at its base, indulge in the beauty and immensity of the esoteric Kailash. Trek from Dirapuk to the north face of Kailash for meditation in its mighty presence, and then back to Dirapuk. Staying another night in the company of this powerful peak will allow you to fully imbibe and take in your experience. The trek comes to a close and you head back to Manasarovar – time to allow the essence of Kailash to take root in you. One more overnight stay at the lake allows you to absorb your experiences. After the immensity of Kailash, enjoy the relaxing journey as you return to Shigatse. This is the final leg of the journey in Tibet, where you stay overnight. Fly back to Kathmandu. Devote the day to exploring this 2000-year-old city. Visit the ancient Pashupatinath temple, considered the holiest temple in Kathmandu. Get your first glimpse of vibrant Kathmandu as you are transferred to your hotel for some rest. A satsang and orientation bring the day to a close. Stay overnight at Nepalgunj, a bustling town close to the Indian border en route to Simikot, our next stop. Experience the incredible flight to Simikot, a town accessible only by air. A small hamlet nestled in the mountain; Simikot is the headquarters of Nepal’s most remote district, Humla. Take a helicopter ride to Hilsa, border town of Nepal, and cross over to Tibet. Feast your eyes on the enchanting beauty of Tibet as you drive to Purang on the Tibetan-Nepalese border. Stay in Purang for an extra day to acclimatize to the high altitude and shop for any last minute supplies. Prepare yourself for incredible vistas of snow-capped mountains and large lakes as you travel to Manasarovar. Your first view of this freshwater lake will be truly breathtaking. Being the highest source of freshwater in the world, this blue and emerald green lake seems otherworldly. Stay overnight on the banks of the lake and drink in the peace that surrounds this space. This will be a mystical day of meditation and invocation. Experience a refreshing and cleansing dip in the lake, which is known to be an epitome of purity and to possess healing properties. Once again, stay overnight at the lake, which allows you to absorb your experiences. Get ready for a trail that is as challenging as it is rewarding. Pack up and drive to the starting point of the trek, Yamadwar, and then trek to Dirapuk. En route, behold the sights of cliff-top monasteries, yak caravans leisurely ambling over snowy passes, and the western face of Kailash. Finally experience the powerful and indescribable phenomenon of this revered mountain. As you stay the night at its base, you have the opportunity to indulge in the beauty and immensity of the esoteric Kailash. The trek comes to a close and you head back to Hilsa – time to allow the essence of Kailash to take root in you. Indulge your eyes on the magnificent Himalayas from up high as you fly back to Simikot and Nepalgunj. This is the final leg of the journey, where you stay overnight. Devote the day to exploring this 2000-year-old city. Visit the ancient Pashupatinath temple, considered the holiest temple in Kathmandu. Sometimes due to last minute changes in government rules or in case of natural calamities like floods, landslides, etc., a few changes in the itinerary may happen. We seek your understanding and cooperation at these times. Those arriving at Kathmandu before the scheduled date are required to make their own stay arrangements. We can suggest accommodation options on request. The hotel where the group will stay will be announced at a later date. Please send your travel itinerary to us at least one month prior to the date of departure. The check-out on the last day is at 12 noon. Please plan your flight accordingly. • Dedicated Isha team to manage the entire sojourn. • A qualified doctor especially trained to handle high-altitude sickness and other conditions that may arise, will accompany the group throughout the journey. The doctor will be equipped with all necessary medications and equipment including life-saving oxygen cylinders and Gamow bags. • Medical Insurance for the entire duration of the sojourn. • Accomodation at Hotel St. Regis or equivalent 5-star hotel for 3 nights in Lhasa on a twin-sharing basis. • Airport pickup and drop off will be available on the specified program start and end dates. • Arrangements and guidance to visit Pashupatinath temple and Patan. • All travel arrangements in Nepal and Tibet with experienced and friendly drivers. • Round-trip flights between Kathmandu and Lhasa. • Round-trip flights between Lhasa and Ali. • Visa and permit fee for Tibet/China. • Best hotels/guest houses available at other places in Tibet. • Mineral water for the entire journey. • Transportation of luggage on yaks during the trek. • Pony for the sick or elderly during the trek. • Complimentary T-shirt and duffle bag. • Down jacket on a returnable basis. • Selected photos of the journey will be sent after the sojourn. • A qualified doctor, especially trained to handle high-altitude sickness and other conditions that may arise, will accompany the group throughout the journey. The doctor will be equipped with all necessary medications and equipment including life-saving oxygen cylinders and Gamow bags. • Personal porter while trekking to Mt. Kailash, if you require one. • Expenses in case of evacuation due to medical emergencies (for travel, boarding, lodging and medical arrangements). • Extra expenses incurred due to natural calamity such as earthquake, landslide, floods or change of government rules, etc. • Gratuity for drivers, cooks and porters on last day of the journey. It is necessary to have completed the Inner Engineering Program. For upcoming programs nearest you, visit www.innerengineering.com. 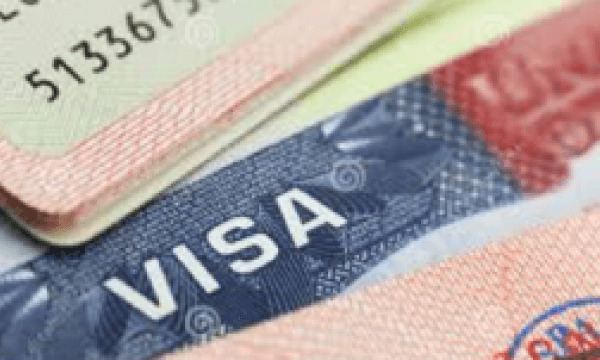 Indian Passport holders do not require a visa for Nepal. 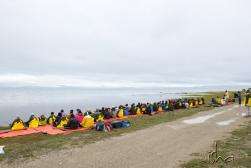 The Tibet permit and visa for everyone will be organized by Isha Sacred Walks. To facilitate this, your original passport is required at New Delhi, well in advance prior to the departure date. The actual date and details will be confirmed based on the group you choose to travel with. A valid passport is needed with a minimum validity of 180 days from the last date of the sojourn. Please note that diplomatic passports are not allowed. PIO/OCI or any other ID cards are not accepted in Tibet. Be physically and mentally fit. Please note that this trek is not advised for pregnant women and those suffering from chronic health problems, like epilepsy, heart ailments, uncontrolled BP, diabetes, asthma, psychological problems, physical disabilities and obesity. Participants must be between 18 and 70 years of age. Those below the age of 18 must either be accompanied by a parent/guardian or must have a consent form signed by the parent/guardian. A complimentary duffel bag will be provided in Kathmandu, where you are required to repack the tems needed for the trek. You will leave the rest of your luggage behind at the hotel in Kathmandu until the end of the journey. Please pack all your clothing and other items in ziplock bags to protect them from rain and moisture. In addition, a backpack with a waterproof cover is required to carry daily essential items. It will be the only piece of luggage allowed in the bus during the travel. The rest of the luggage will follow on a truck. Please note that video cameras are not permitted. *If you do not have a down jacket with hood, it can be made available to you on a returnable basis in Kathmandu. Please note that in case of loss or damage, you will be required to reimburse the cost of the same. It is important to carry a personal medical kit with electrolyte packs, pain killers, muscle relaxant cream, band aids, knee support, medicines for fever, common cold, headache, nausea, vomiting, diarrhea, indigestion, and any other medication necessary. If you are being treated for diabetes, please check with your physician if any change in medication is needed due to the altitude and trekking involved on this journey. • The currency used in Nepal is Nepalese Rupees and Indian Rupees (Rs). • The currency used in Tibet is Chinese Yuan. where assistance will be provided. • We recommend you convert a minimum of Rs. 10,000 to Yuan for personal expenses. • If you wish to hire a personal porter, it will cost approx. Rs. 8,500 for three days. Please convert this amount to Yuan in addition to the amount mentioned above. • Credit cards are not accepted for currency exchange. • Credit cards are accepted for purchasing items only in some shops in Kathmandu and Lhasa. We suggest you carry cash for all your purchases. Pay phones are available in Kathmandu, Lhasa, Shigatse and Saga. Airtel roaming works fairly well till Lake Manasarovar. The program coordinator will be equipped with a local China phone at Manasarovar and Kailash for emergency communication. Weather conditions from May to September in Tibet can be expected to be dry and sunny, with precipitation in July and August. The daytime temperature can be between 10° to 22° Celsius. However, the intense sun at high altitude can make it feel even hotter. There can be an incredible drop in temperature from early afternoon to evening time. The temperature at night can drop as low as 0° or -10° Celsius. Lack of oxygen at high altitudes (over 2,500 m) affects most people to some extent. With an increase in altitude, the human body needs time to develop physiological mechanisms to cope with the decreased oxygen levels. This process is called acclimatization. Diamox (Acetazolamide) tablets are necessary to counter high altitude sickness. Please see your doctor for a prescription as it is mandatory to start taking these tablets three days before arriving in Kathmandu. This medicine must be taken for the entire duration of the journey. Those allergic to sulfa drugs can alternatively take Gingko Biloba, a natural supplement available at online stores. During the trip, participants will be given simple, yet unique and tested practices for faster acclimatization. A qualified doctor, especially trained to handle high altitude sickness and other conditions that may arise, will accompany the group throughout the journey. The doctor will be equipped with all necessary medications and equipment including life-saving oxygen cylinders and Gamow bags. Tibet, referred to as the highest region on earth, is also one of the least developed parts of the world. Being extremely remote and isolated, the facilities for pilgrims - although being upgraded - are still very basic. Modern amenities are very hard to find in the hotels and guest houses in Western Tibet. The quality of accommodation will vary from place to place. It may be necessary at times to share a room with a few others or participate in an outdoor toilet adventure, or go without a shower for a few days. Rest assured, in every instance we will provide you with the best accommodation that the place has to offer. We have successfully taken thousands of people to these sacred places for many years now, and we will always be there to support you and make the journey a pleasant one. Isha is not a tour company, yet we offer this sojourn with the intention of providing you with the opportunity to experience these sacred places in their true depth and dimension. • Post Training Support, including ongoing practice corrections and new teaching material. • Introduction to classical South Indian medicine, the ancient Siddha science. • Classes and materials in anatomy and physiology. • Access to a growing network of teachers and teaching opportunities. What is the eligibility criteria to be a part of the Kailash Manasarovar sojourn? You must be medically fit, holding a valid passport with 180 days of validity. Entry into Tibet on diplomatic passport is not permitted. People above 65 years of age are requested to undergo additional medical tests to determine their physical fitness. Participants must be between 18 and 65 years of age. Participants below the age of 18 must either be accompanied by a parent/guardian or a consent form needs to be signed by them. 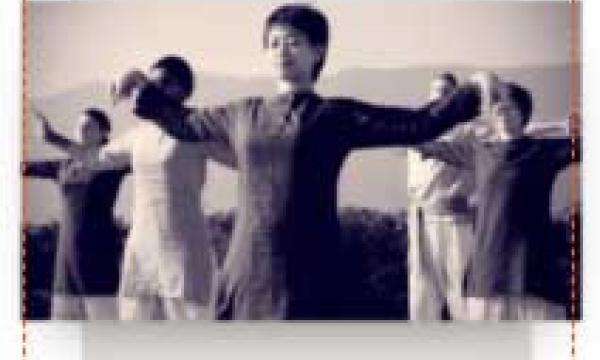 People above 65 years of age are requested to undergo additional medical tests to determine their physical fitness. How do I get visas to Nepal and Tibet? A valid passport is needed with a minimum validity of 180 days from the last date of the Kailash sojourn. Non-Indian nationals require a 15-day multiple entry visa which can be availed on arrival at Kathmandu airport, Nepal. Will there be any major expenditure apart from the program cost? There could be expenses, if you choose to hire a pony or a porter during the trek. How many hours of travel is involved at a stretch? You may be required to travel for a 5 hr – 8 hr stretch. What are the arrangements for communication en-route? Pay phones are available almost everywhere. BSNL and Airtel cell phones work fairly well in the Himalayan region. Could you give me details on the accommodation conveniences provided? Although home to many scenic and tourist places where there has been a lot of development, the places of pilgrimage still remain very basic in terms of conveniences. Therefore, the quality of accommodation can be very basic and it may be necessary at times to share a room with a few others. 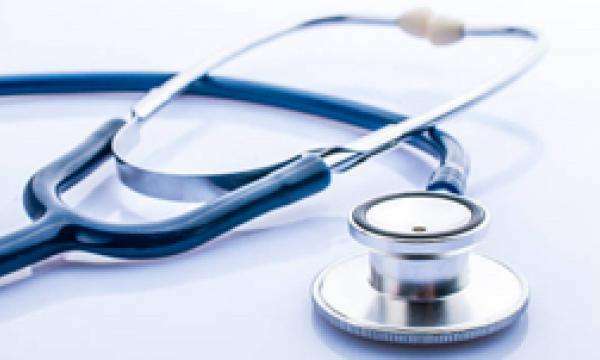 Do we need to undergo medical tests? Why is it necessary? Yes. 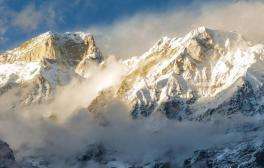 You are required to trek through high altitude regions. In such places, air pressure and density is decreased compared to mean sea level and people may suffer from hypoxia (oxygen deficiency). Participants hence need to be screened thoroughly before they are exposed to high altitudes. I have been to high altitude last year and my stay was uneventful. Do I need a medical exam? Yes, it is necessary to undergo medical examination every time before going to a high altitude region. How can I qualify medically? By undergoing all the medical tests mentioned in the medical form and consulting your physician about your fitness to travel to a high altitude of 19,000 feet and above. Do I need to carry the medicines which I have been taking and prescribed by my doctor? Yes, you are advised to take sufficient stock of medicines to last the entire duration of the trip. In case of emergencies, what are the steps that will be taken by you? A qualified and well-equipped doctor specially trained to handle high-altitude sickness and other conditions that may arise, will accompany you throughout the program. Where can I buy warm clothing and shoes? Any recommendations? Warm clothing such as thermal wears, gloves, woolen socks, etc are available in major cities like Delhi, Mumbai and Bangalore, etc. For shoes, any brand such as Nike, Adidas or Reebok offers good water-resistant shoes and are available in almost all cities and towns. Can I go for Mt. Everest and Mukthinath? Going to Mt. Everest is not recommended given the high rate of aircraft accidents. Travel to Mukthinath is possible if the weather is good and you are willing to stay for an extra 3 – 5 days along with the additional cost. 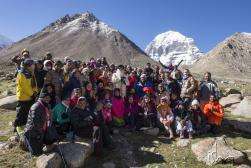 ​"My experience has been awesome for Kailash Mansarovar Yatra 2017. I'm amazed the way Isha volunteers took care of us with all the grace and patience. A big thanks to Sadhguru and Isha Foundation for taking me to the most beautiful journey of my life."